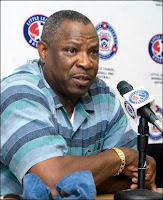 Well, the Reds made it official with the announcement of a three year contract for Dusty Baker and Cincinnati toothpick merchants couldn't be happier. Baker would not be my first choice or even my 99th choice, but the "i"s have been dotted and the "t"s have been crossed, so it's a done deal. Accordingly, there's nothing left to do but take an objective look at the Pros and Cons of one Johnnie B. Baker Jr., also known as Dusty. Dusty is the ultimate players' manager and he is typically very popular in the clubhouse. Baker is a manager who was able to handle Barry Bonds and his antics for several years, granted Baker seemingly let Bonds just play by his own rules. In addition, Baker always seems to have strong relationships with his players, which creates effective communication. Over the years, the Reds have suffered from a lack of communication in the clubhouse, as there was seemingly a constant rift between the players and management. Baker will ensure that their is no communication problem in the clubhouse and is unlikely to ruffle anyone's feathers. In addition, this kind of environment may lead to a more cohesive unit on a team in which the whole has always been LESS than the sum of the individual parts. During his 10 years in San Francisco, Baker compiled a Win/Loss record of 840-715 for a Winnign Percentage of .540. During his 4 seasons in Chicago, Baker posed a W/L record of 322-326 for a W% of .497. Overall, Baker is a "winner," as evidence by his career record of 1162-1041 for a .527 W%. So, if you believe that a winning track record as a manager is indicative of future performance, then this a definite positive. Dusty brings instant credibility to the organization, as he is a "name" manager who is well known in baseball circles across the nation. This move increases the media recognition of the Reds and brightens the spotlight on baseball's oldest franchise. Having Dusty at the helm will make the nation and the media sit up and take notice of the Reds more than the previous lesser lights at the helm of the Reds. In addition, this move ends the non-stop turnover at the manager position, as Dusty is very likely to serve out his entire 3 year contract in Cincy. His track record will give him the benefit of the doubt and then some in Cincinnati. The odds of him being fired before the end of his 3 year contract are very slim. The Reds have needed stability in the front office and on the field, so retaining Krivsky and bringing in Dusty will achieve that goal. This is biggest concern about Baker for Reds fans and one I touched on earlier. Dusty Baker does not believe in pitch counts and has consistently exhibited a tendency to overwork young pitchers. He did it with Mark Prior, Kerry Wood, and Carlos Zambrano in Chicago and he did it with Joe Nathan in San Francisco. This is a big cause for concern for Reds fans as the organization is FINALLY on the verge of developing some quality young pitching. It has been several decades of frustration for the organization and fans, as top pitching prospects have been felled by injuries and ineptitude, leaving Tom Browning as the last quality starting pitcher developed by the Reds. Homer Bailey and Johnny Cueto are looking like top of the rotation starters in the near future, so handing their futures over to Dusty Baker seems like a risky proposition, to say the least. Reds fans should be VERY concerned about Baker and his tendency to overwork his young starters. Throughout his managerial career, Dusty has played favorites. He has always had an affinity for certain veteran players, which would be fine if those players were more productive. However, the players he favors are often those who aren't overly valuable or productive. Over his managerial career, Dusty has loved infielder Ramon Martinez, Neifi Perez, and Darren Lewis. This tendency wouldn't be a problem if Dusty picked more productive veterans to favor, but his favorites often seem to be players who are bested suited to limited duty. Unfortunately, being a "Dusty favorite" always results in a player receiveing more playing time than is deserved. Regrettably, his preference for veterans may result in an inequitable distribution of the playing time in Cincinnati. Throughout his career, Dusty has proven himself to be rather thin skinned. In San Francisco, which is a very laid back media environment, Baker constantly blanched at perceived criticisms. The environment in San Francisco pales in comparison to the pressures of the East Coast, where criticism, where justified or not, is quite simply the name of the game. In Chicago, Baker took exception to criticism from broadcaster Steve Stone, which ultimately led to the "resignation"/departure of Stone. Once again, Baker handled criticism poorly and it negatively impacted the organization. The media scrutiny in the Midwest isn't as harsh as in New York, but it would seem to be harsher than on the West Coast. Accordingly, it's not unreasonable to expect friction between Baker and the media during his time in Cincy. In fact, a confrontation between Dusty and the Brennaman boys seems like a forgone conclusion, as the Brennamans specialize in criticizing the hometown squad in their never ending "quest for objectivity." 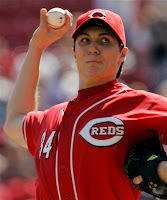 The 2008 season will be a pivotal one for the Reds, as the Reds will begin working impact homegrown pitching prospects (Homer Bailey & Johnny Cueto) into the rotation and begin to rely heavily on top offensive prospects (Jay Bruce & Joey Votto). These two factors, to a large extent, will determine the success of the Reds over the next 5 years. Unfortunately, Dusty Baker is the exact wrong choose to reach those two goals. Baker's preference for veterans may result in him favoring Scott Hatteberg (if he's back) over Joey Votto or Ryan Freel over Edwin Encarnacion or Jay Bruce. To be successful, the Reds need to be relying MORE heavily on young talent, not LESS. This is just one reason that Dusty is coming along at just the wrong time for this organization. 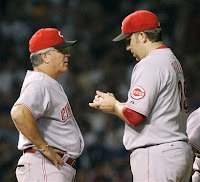 In addition, Dusty's long exhibited tendency to overwork young pitching prospect is a disastrous tendency for the Reds in 2008. The Reds finally have some impact pitchers coming out of their farm system, but now they seemed destined to be ruined at the MLB level. The success of the organization over the next decade rests largely on the right arms of Homer Bailey and Johnny Cueto, so any move that increases their risk of injury is a poorly conceived idea. On the bright side, maybe the Reds can act fast and get the volume discount on Tommy John/Shoulder Surgeries. All in all, unless Dusty can reign in his two negative tendencies, it's difficult to see how this hire makes sense. I'd feel much better about this hire if the Reds were able to follow it up with a hire of Leo Mazzone to handle the pitching staff. The Pope of Pitching would offset Dusty's harmful tendencies, but the Reds are probably last on his list of destinations. To be successful, Dusty needs to learn to limit the workloads on young arms and rely on young talent over less talented veterans. While his managerial track record doesn't show any evidence of it, Reds fans better hope that an old dog can learn new tricks. 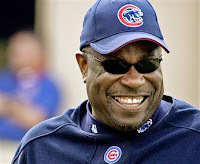 Reports indicate that the Reds are interested in Dusty Baker, who would be about the last person the Reds should hire. Dusty has a long history of favoring veteran players (Neifi Perez, Mark Gardner, etc) over younger ones. Even more disturbingly, he has a power track record in handling young pitchers. Given that the Reds are finally on the verge of developing impact starting pitching to end a decades long drought, handing the careers of those young pitchers over to Dusty Baker would be a disaster. Baker was handed one of the top pitching prospects to come out of the amateur ranks in quite a long time. After his first full season under Baker's direction, Prior has never been the same. You can debate how much of the fault lies with Baker, but given the research of Will Carroll based on the work of Dr. Mike Marshall, Dr. James Andrews, and Dr. Frank Jobe indicates a dangerous correlation between heavy workload at a young age and shoulder/elbow injuries. The injury risk for pitchers aged 23 or younger is much higher than for other pitchers, which is why most wise organizations limit the workloads and pitch counts of their young pitchers. 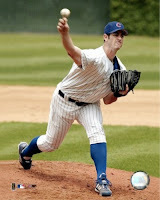 In 2003, Mark Prior was 22 years old and enter his first full season at the MLB level. He was coming out of USC as one of the most heralded pitching prospects of recent memory. He had a fantastic season in 2003, one for the ages, but he's never been the same since. Here's a look at Prior's workload and Dusty's handling of him during that season. In 2003, Mark Prior pitched 211.1 regular season innings and then went on to throw 23.1 more innings in the postseason, so he threw a cumulative 234.2 innings in 2003. So, he only threw fewer than 100 pitches in 4 out of his 30 starts. More fun facts, look what Dusty did to him in September, when the Cubs needed to make a push for the postseason. By my count, that's 6 starts and 757 pitches in September at the end of a long season. Not to mention, back to back starts of 130+ pitches in the final 2 weeks of the season. After a long year and a lot of innings, Dusty had Prior throw two of his highest pitch count games. When you add in the 366 pitches he threw in 3 post season games, Prior threw a grand total of 3,764 pitches in 33 starts in 2003. Just to help put Prior's workload in his age 22 season into the appropriate context, let's compare his workload to that of legendary workhorse Aaron Harang. So, at the ripe old age of 22, Mark Prior threw more pitches in a single season (combined regular season and postseason) than Aaron Harang ever has. And, he did it in fewer starts, which means that he threw far more pitches per start. Modern researches also indicates that an arm is much more susceptible to injury when fatigued, so throwing more pitches means that the risk of arm injury is even higher. Evidently, Prior should be thankful that he missed a few starts over a stretch in July/August, or else his arm might have just flown right off. In short, what happened to Mark Prior in 2003 is something that should never happen in the modern game. Modern medicine has removed some of the fog over pitching injuries and revealed that one of the quickest ways to ruin a young pitcher is to overwork him. It cannot be definitively said that Baker caused Prior to get injured, but given what we know about young pitchers and heavy workloads, he certainly put Prior at a substantially higher risk of injury. Given the pivotal role that Homer Bailey and Johnny Cueto will be required to play in the future for the Reds, Dusty Baker is absolutely the wrong choice as manager. The Reds have taken a lot of steps to improve their player development department to ensure the health of their young prospects, but hiring Dusty Baker would be a gigantic step backwards. 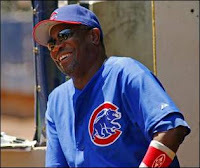 Just say no to Dusty Baker. I've heard complaints recently about Cincinnati Reds fans and their propensity for showing up in large numbers for select giveaways. The giveaway item that is most often cited is the (in)famous Bobblehead. Accordingly, I thought I'd check to see if the Reds did get substantially more fans on Bobblehead nights. In 2007, the Reds had four separate Bobblehead nights. These four giveaways were spaced out over the season, with one each falling in May, June, July, and August respectively. The Bobbleheads were of Bronson Arroyo, Aaron Harang, Frank Robinson, and father and son broadcasters Marty & Thom Brennaman. For what it's worth, the Brennamans clearly fared the worst of the four promotional giveaways, as the other three giveaways were close to, or exceeding, 30,000 fans. On average, the Reds had a paid attendance of 28,882 on Bobblehead nights. But, how does the Bobblehead average stack up against the Reds average attendance in 2007? Well, in 2007, the Reds drew 2,056,453 fans over their 81 home games. That's a per game average of 25,388. So, on average, the Reds drew 3,494 more fans for Bobblehead games than non-Bobblehead games. That's a percentage increase of 13.8%. All in all, Reds fans do like their Bobbleheads. Unfortunately, many will point to this as evidence of a fickle, unsophisticated fan base, but whatever the reason, at least they attended. Die-hard fan or not, their revenue spends the same for the Reds. In short, long live the Bobbleheads!!!! It's always fun to speculate about what the Reds should do in 2008, and after a frustrating 2007 season, I think it's time for some changes. Accordingly, here is what I'd like to see the Reds do to substantially improve the defense in 2008 and shift the core of the team from Dunn/Griffey to Bruce/Hamilton/Phillips/Votto. First of all, bring in either Barry Larkin or Wally Backman to manage. I'm not real pleased with the Reds and where they stand as of now, so it's time for some big changes. 1) Trade Adam Dunn to the Rangers for Jarrod Saltalamacchia and give the Rangers a window to lock him up longterm. ***Rangers need power and Dunn may be of interest if they can lock him up long-term. As always, we need a catcher. 2) Trade Ken Griffey Jr. to the Mariners for Brandon Morrow. ***Get a top flight young arm and salary relief. 3) Trade Edwin Encarnacion, Todd Coffey, and Chris Valaika to the Giants for Jonathan Sanchez and Kevin Correia. ***Edwin's defense no fits in with the newly configured Reds. Get two quality starting pitching options for the 2008 rotation. Giants get one young everyday player, a quality position prospect, and a live arm in Coffey to help out in the bullpen. 4) Trade Alex Gonzalez and Mike Stanton to the Tigers for Brandon Inge. ***Tigers need a shortstop with C.Guillen moving to first and Brandon Inge is a top defensive 3rd baseman with good power. Moving from Comerica will only help his numbers and Inge has the intangibles and grittiness that Edwin seems to lack. The salaries are similar, but Inge costs a bit more than A-Gon. By adding Stanton to the deal it essentially offsets the difference and prevents us from having to eat Stanton's contract. 5) Trade Rafael Gonzalez or Travis Wood to the Astros for Adam Everett. ***Give up a second tier pitching prospect for the best defensive player in baseball. 6) Trade David Weathers and James Avery to the Phillies for Jayson Werth. ***Phillies have a glut of outfielders and need pitching. Weathers fills a need in the bullpen and Avery provides them with a decent pitching prospect. Werth is strong offensively and tremendous defensively. ***Castro is terrible and is a very poor use of a roster spot. He must be gone!! ***Not as good as he used to be, but an improvement for the Reds. ***Injury risk, but very strong when in the lineup. 10) Buyout the option year on Javier Valentin. ***Javy is a decent player, but just not a very good one. 11) Bring back Everyday Eddie. ***Let's not forget how he solidified the bullpen in 2006. Personally, I don't think he's done yet. 12) Sign Jose Cruz Jr.
Switch hitter with good pop, on base skills, and tremendous defense. Great defense in the outfield and improved infield defense. Great shutdown bullpen with 3 quality lefties to offset the lack of lefties in the rotation. Solid starting pitching with a lot of youth and big upside. Good depth on the bench with Cantu, Keppinger, Freel, and Cruz Jr.
And a well balanced lineup (Phillips/Inge/Werth from the right, Hamilton/Votto from the left, and Salty as a switch hitter) with lefthanded Jay Bruce on the way. As it stands now, I don't think the Reds are configured to win. The defense just flat out isn't good enough. The defense is the foundation of a team and the Reds can't build a winner on a shaky foundation. Adam Everett and Brandon Phillips would from the best middle infield defense in baseball. With a shoddy team defense, the Reds are always trying to run uphill to overcome the deficiencies. If they had a great defense, then they constantly be ahead of the game and running down hill all season long. It's time for big changes in Cincy. Let's roll the dice and see what happens. With the 2007 season in the rearview mirror, it's time for the Reds to bring looking towards 2008. In that spirit, Wayne Krivsky announced that the Reds would begin their search for a manager in earnest. The Reds will be looking at candidates from outside the organization, as well as interim manager Pete Mackanin. That said, it's difficult to envision Mackanin being retained as manager for 2008 and beyond. One would think that if that was going to happen, it would have happened before now. "Pete is a candidate. He's definitely a candidate," Krivsky said. "People ask me about timetables and there isn't one. I'd rather get something done sooner than later. The sooner we know, it takes the uncertainty out of people's minds that are here." The other 3 interim managers in the majors in 2007 (Cecil Cooper, John McLaren, and Dave Trembly), all had their interim tags removed already, so it's difficult to imagine the Reds giving Mackanin serious consideration at this point. The Reds desire to go outside the organization would seem to provide substantial evidence that they do not view Mackanin as a viable long-term option. Given the Reds instability at the manager spot over the past decade or two, the Reds seem to be handling the situation wisely. To take the next step, the Reds need to continue to fill each spot in the organization with a quality option. Adding a top notch manager to the mix could bring the Reds much needed stability. Since the Reds replaced Pete Rose in 1989, the Reds have gone through nine different managers and actually had three different managers in 2003. Over that time, not one manager has lasted at least four seasons and Ray Knight actually had two stints at the helm. It's obvious that the Reds recognize the importance of getting it right this time, so expanding the search to outside candidates is a very good sign. To take a step forward, the Reds need to continue adding pieces to the puzzle. Adding a top flight manager would be a big piece.